All bags are constructed of coated 100% polyester with heavy duty black webbing that goes completely around the bag for strength printed with the word Firefighter. All zippers are heavy duty, with two heavy duty sliders on the main compartment. Bags are nylon stitched and are designed to last and stand up to rugged treatment. 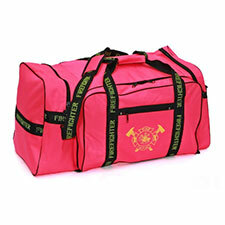 Plenty of room in this bag, which is designed to hold your turnout gear, helmet, boots and other miscellaneous equipment. Four pockets: 2 flat outside: 10" x 10" and 13" x 9"
2 full depth end pockets 16" x 14" x 2" and 16" x 14" x 8"